House Edit - Where our friends and fellow creatives share with us their craft, inspiration and their most loved or coveted pieces from Swedish House and beyond. We hope this will interest and give insight into the essence and distinctiveness of the products we have curated and stock. Aime Cox-Tennant is a blush-obsessed brand and marketer from Bristol, UK. Aime began 2019 by opening her new inspiring space for creative business owners, Studio Cotton. 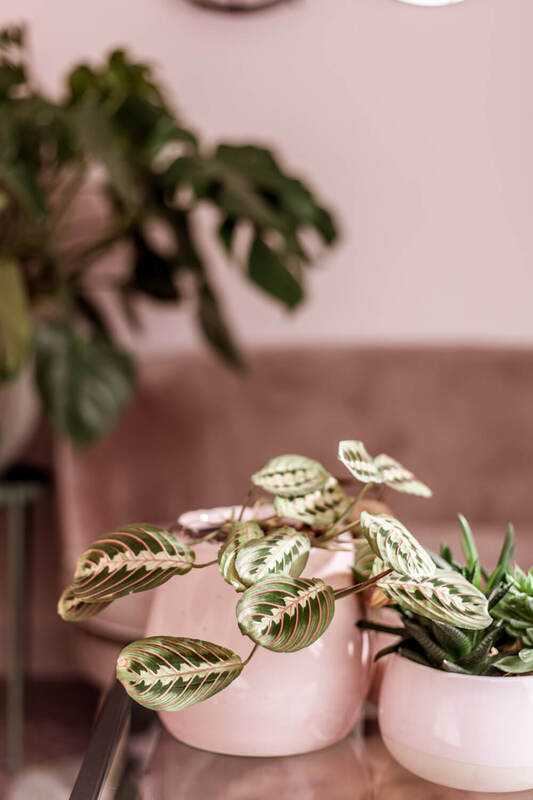 Nestled within Bristol’s Old City, Studio Cotton is a little oasis of plants, pink and the crafted goods of local makers. But, it wasn’t always like this. The space was originally like any other office – empty walls, blue carpet tiles and 11 different types of light fitting (yep, Aime counted). Over an intense 6-week renovation schedule, the space was transformed. 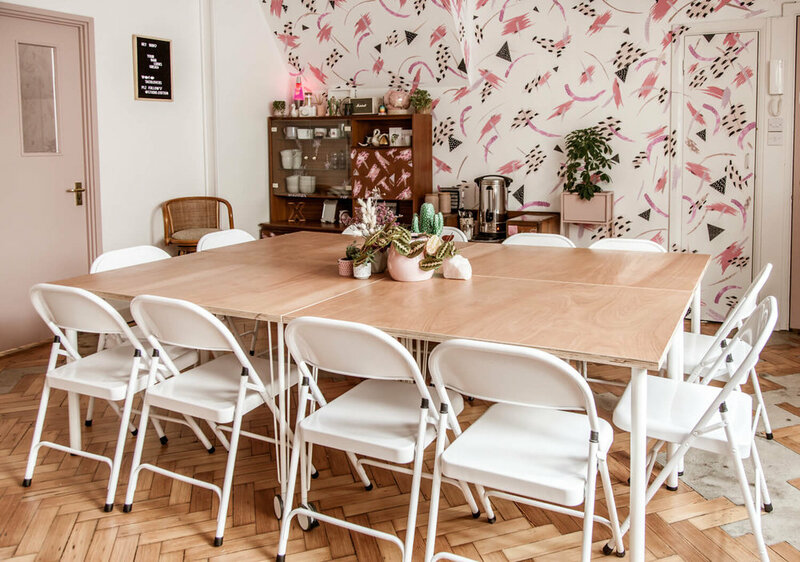 The parquet floor exposed, the walls painted, a mural criss-crossing vintage furniture finds, and so, so many plants come together to create a truly unique studio, and a home for Aime, her workshops and small businesses in her beloved Bristol. In our Spring 2019 edition of House Edit, we’re speaking to Aime about her favourite spots in the city, décor inspiration and her favourite Swedish House at Home products. Plant-killer-turned-plant-lover Aime is spoiled for choice in Bristol, a city filled with independent florists, garden centres and plant shops. A lot of the Studio Cotton plants are from Aime’s own home and have been collected over many years, but some of the most eye-catching were chosen specifically for the space. Although the Studio Cotton renovations were completed in record time, it took a couple of weeks to create the defining feature that defined the studio’s relaxed, homely aesthetic. The gallery wall. Aime dashed to Ikea in search of simple black frames in the hope that she had enough prints from her old office, her home, and her close community of makers that might lend the needed finishing touch. “It was only meant to be a temporary fix, but by some grace the collection of prints I could find in 24 hours was just right. I joke that it’s a wall of pinks, plants, cats and butts, but it’s also perfect, and exactly what the space needed. The majority of the prints were sourced from Bristol’s many talented artists and illustrators, many of whom Aime met through her work with Bristol Etsy Team. “That’s what I love about Etsy. You can be so darn specific – I want a black cat, in a kitchen, with a monstera – and you can find the print. Perfection!”. The Studio Cotton gallery wall features prints from Little Paisley Designs Do it Later Illustrations Pencil Pusher Store Cairn & Grace and Niaski. The Studio Cotton furnishings are not what you’d expect from a normal business. The studio houses a workshop table (made by Aime’s husband and co-director, Alex), a few Ikea essentials as well as bargain vintage finds, all of which are set off with a select number of key pieces that add a premium feel. “Next on the list is storage. We’re still a business with the usual supplies and sundries, but we don’t want that on display. At the moment, we can just about fit everything into our single cupboard, but that needs to change”. Aime has her eye’s set on the new range of lockers from Mustardmade, now available from Swedish House at Home. These stylish pieces are bold but timeless, and will beautifully compliment the eclectic studio. “You have no idea how many conversations I’ve had about the studio’s scent profile”. Aime knew from the beginning that Studio Cotton didn’t just need to be photographed, it needed to be experienced. “Scent is a big turn-on, and a big turn-off. I want my team and clients to walk and feel immediately spoiled”. This attention to detail runs through every feature at Studio Cotton, including the hand soap. “I get a little hit of joy with every whiff of the L:A Bruket hand wash, and who wouldn’t want that every day”.